Rutte said he would seek to control the damage caused by the weekend incidents when he prevented two Turkish ministers from campaigning in the Netherlands. ROTTERDAM, NETHERLANDS: After an unprecedented diplomatic fight between the Netherlands and Turkey, Dutch Prime Minister Mark Rutte said Sunday he would seek to control the damage caused by the weekend incidents when he prevented two Turkish ministers from campaigning in the Netherlands. Rutte's actions, which came two days after several German municipalities canceled rallies that Turkish Cabinet ministers had planned to address, prompted Turkish President Recep Tayyip Erdogan on Saturday to accuse the Dutch of being "Nazi remnants." 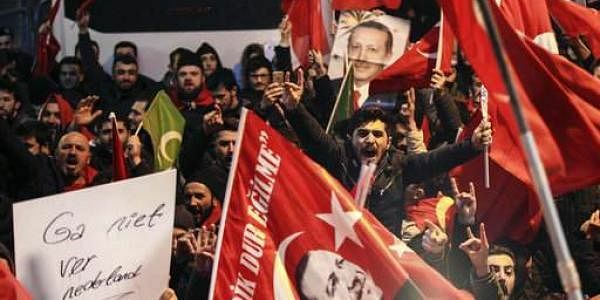 At the same time, Turkey kept its drive going to rally people of Turkish descent living in European Union nations to back a referendum that would expand Erdogan's powers. After being denied landing rights in the Netherlands on Saturday, Foreign Minister Mevlut Cavusoglu addressed crowds in the French city of Metz, where the French government had no qualms about permitting government representatives to Turkish rallies. The Netherlands said Turkish attempts to campaign here touched at the heart of Dutch citizenhood, although hundreds of thousands have Turkish roots and many still feel committed to their ancestral homeland. "The biggest problem in this case is that Turkey is talking about Turkish citizens who they want to talk to," Rutte said. "These are Dutch citizens who possibly also have voting rights in Turkey." The diplomatic fight comes at a tough time in the Netherlands, which has national election on Wednesday, and where issues of Dutch identity and relations with migrant communities and Islam have taken center stage. In a neck and neck race, the parties of either Rutte or populist firebrand Geert Wilders could end up the most votes. Rutte said it was important for his government not to bow to Turkish pressure, especially, he said, after Ankara threatened sanctions if the Dutch kept its ministers out. "Turkey is a proud nation; the Netherlands is a proud nation. We can never do business under those sorts of threats and blackmail," said Rutte. Still, added the prime minister, his government "will keep working to de-escalate where we can. If the Turks choose to escalate, we will have to react, but we will do everything we can to de-escalate." After a tense standoff outside the Turkish consulate in Rotterdam on Saturday night, Turkey's family and social policies minister, Fatma Betul Sayan Kaya, was escorted back to the German border. Police in Rotterdam said they arrested 12 people as a demonstration outside the Turkish consulate in the city devolved into rioting. Police spokeswoman Patricia Wessels said the arrests, made for alleged violence and public order offenses, came as protesters pelted police with bottles and rocks early Sunday. Police responded with baton charges and a water cannon. Wessels says seven people were injured in the brief explosion of violence, including one police officer who suffered a broken hand.